Finally, you can have the best of both worlds when it comes to grapefruit in our new "Pom-Oro Specialty Combo Pack" from Pearson Ranch! As odd it may sound, Pomelos are the "parent" of most modern day grapefruit varieties on the market, however they aren't actually classified as a grapefruit. But when it comes down to their flavor, fragrance and lack of bitterness they truly are in a class all by themselves! Long prized in Asian cultures as a symbol of good luck for lunar new year celebrations, they are now being enjoyed by everyone who tries them. What are Oro Blancos, other than wonderful and delicious grapefruit? Well, referring to the subtle "white" flesh of the fruit, Oro Blanco in Spanish literally means "white gold." 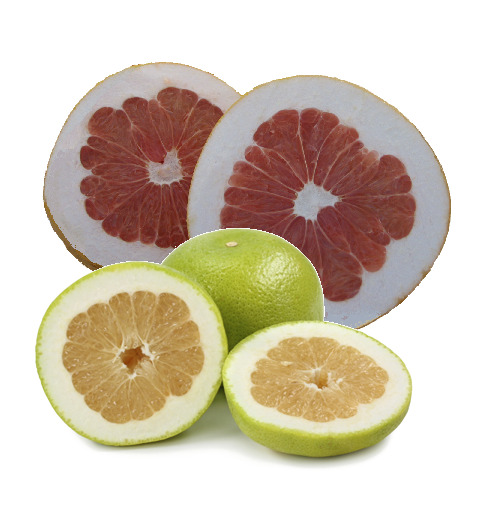 Spelled either as one word (Oroblanco), or two (Oro Blanco), this grapefruit is a cross between a pomelo and a white grapefruit. Oftentimes also referred to as a "Sweetie", they are indeed sweet, while lacking the bitterness of a common grapefruit. With a thicker skin, they are as easy to peel as an orange. Both the Pomelo and the Oro Blanco are filled with up to 110% of the recommended daily allowance for Vitamin 'C' in each one! Both are incredibly delicious and fragrant and great to enjoy both as a part of a healthful breakfast or as an anytime snack. But best of all both are now available in one box from Pearson Ranch! Get 20 lbs of delicious "goodness" with 6 or more Pomelos* and 5-10 Oro Blancos* in our "Pom-Oro" Specalty Combo Pack. *number of pomelos and oro blancos depends on the size and weight of fruit available at the time of shipping.